Star Heavy Duty Self-Dumping Hoppers are constructed of 1/4″ and 3/16″ steel plate to withstand the use and abuse of a fast moving construction job. These are not the thin sheet metal hoppers you find in many industrial plants but rugged long lasting hoppers designed for the construction industry. Ideal for removing broken-up concrete, plaster, brick and other construction refuse. Hopper Safety Lock – a separate lock prevents the hopper from inadvertently dumping when traveling over rough terrain. 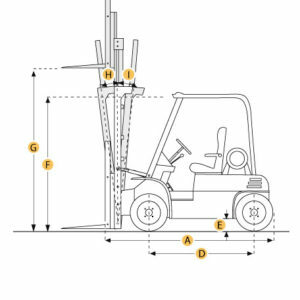 Universal Fit – Can be used with both straight-mast and extendable-reach forklifts. Pocket Base accommodates forks up to 10″ wide and 2½” thick. 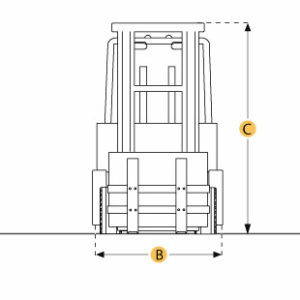 Safety Chain & Storage Hook – secures hopper to forklift and prevents hopper from accidentally sliding off forks. The hook keeps the chain out of the way when not in use. Safety Lock: prevents accidental discharge when transporting a load. Must be disengaged before hopper will dump. Rope Release – can be used to trip the hopper from the ground or from the operators seat. Heavy-Duty Casters Model 1000-0510 – Star Self-Dumping Hoppers are available with Heavy-Duty Steel Casters and 8″ diameter Polyurethane Wheels with Roller Bearings. The combination of the larger wheel size, roller bearings, and the polyurethane tire material makes it easier to push the hopper over trash and foreign objects. Rear wheels swivel for easy maneuverability. Casters are bolted to hopper (not welded) so they can be easily replaced if damaged. Lifting Hooks Model 1800-LH – Optional Lifting Hooks (eyes) are available for handling hoppers with a crane. 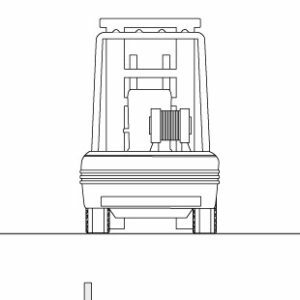 A hook is welded to each corner of the hopper. Shackles should be used to attach slings to hooks. Heavy duty hooks are designed to handle the weight of the empty hopper plus it’s full rated load capacity. Please Note: Hopper can not be discharged while suspended with a crane. 1805N ½ yd3 4,000 lbs. 42″ x 32″ 49″ x 32″ 36″ 440 lbs. 1810 1 yd3 6,000 lbs. 48″ x 39″ 62″ x 39″ 39″ 605 lbs. 1815 1½ yd3 6,000 lbs. 55″ x 43″ 67″ x 45″ 46″ 775 lbs. 1820 2 yd3 6,000 lbs. 57″ x 58″ 66″ x 57″ 48″ 925 lbs. 1825 2½ yd3 6,000 lbs. 57″ x 58″ 67″ x 57″ 55″ 1025 lbs. *Note: Weight capacity of hoppers with casters is 4,000 lbs. less the weight of the hopper.